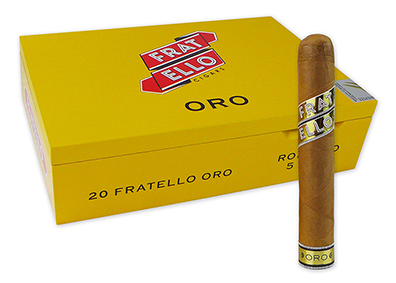 Fratello Oro cigars are the third in Omar de Frias' lineup of premium cigars and offer a significant divergence in blending from his Fratello and Fratello Bianco lines with its Ecuadorian Connecticut wrapper, Cameroon binder, and Dominican Ligero/Nicaragua Esteli Viso/Columbian long filler tobaccos. This may be a milder, creamier cigar than its counterparts, but it's equally full of flavor. Another first for Fratello Cigars, the medium-bodied Oro is produced at the La Aurora cigar factory in the Dominican Republic where Omar was given free rein to explore and blend with their amazing tobacco inventory. The end result is a well constructed, richly flavored, creamy cigar with a subtle spiciness and notes of cedar, nuts, and dried fruit. An excellent choice for almost any level of cigar aficionado.